We’ve looked at Amish participation in Pennsylvania fire companies before. And each year mud sales are held throughout Lancaster County to support those companies, which are known for their heavy Amish makeup. Fire company photos by Ed C.
But did you know that some Amish in New York also serve as volunteer firemen? According to the Rochester Democrat & Chronicle, Amish are members of two fire companies in western New York, in Ovid and Interlaken. This is Seneca County, home to a four-church-district Amish community. The Ovid community is a Lancaster-origin settlement (it technically originates from the Brush Valley community in Indiana County, PA; see The Riddle of Amish Culture p. 337). In past years, both fire companies have had campaigns to entice citizens to volunteer but they have not been successful, so the practice has been discontinued. Surprisingly, it was the Amish who approached each fire company about joining. Palmer, 70, who’s been with the Ovid company 52 years, says there are 10 Amish firefighters out of 57 active members in his department. Interlaken, a company of approximately 40 members, has one Amish firefighter. They range in age from 19 to 30. 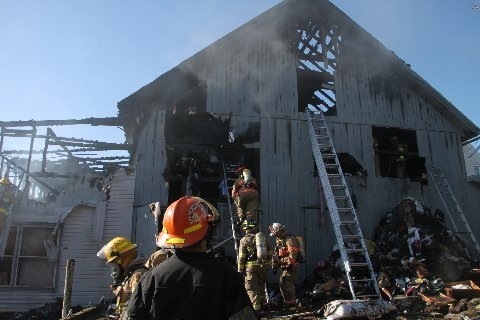 Both Palmer and Standard are on guard to protect the relationships they have cultivated with the Amish firefighters. Members of both fire companies are careful not to infringe upon Amish beliefs. The English (non-Amish) and the Amish have developed a community partnership through the fire companies. Recently, the Amish have participated in 9/11 memorial ceremonies and one family attended this year’s annual fire company banquet. One Amish firefighter even rode in a fire truck during the Trumansburg Fair Fireman’s Parade. How do Amish find out about the fires–and how do they get to the firehouse? One young firefighter arrives at the firehouse by man-powered kick or push scooter. He has repeatedly tested the terrain over the course from his rural farmhouse to the village and, gaining speed over time, now makes it in six and a half minutes. To alert motorists, he wears a reflective safety vest. Only those without facial hair (the unmarried) are allowed to go into a burning structure. Bearded or beardless, they are appreciated. “They’re fearless,” says the Interlaken department chief. Reading about the young firefighter who scooters to the firehouse, and the rule against men with beards going in to certain fire situations, has got me wondering about something. Broadly, do Amish volunteer fire fighters wear standard issue uniforms on site? I mean the large jackets and helmets typical of most volunteer and professional fire departments? They do wear the standard gear Shom, at least from what I have seen on my visits to firehouses in Lancaster and everywhere else I’ve seen information about Amish in fire companies. It’s an interesting question though as there have been disputes in the past over hard hat requirements on jobsites, and OSHA granted the Amish and Sikh adherents an exemption from wearing them in the 1970s, later expanded to all religious groups. Since participation in fire companies is more elective than necessary to one’s livelihood, I doubt there would be the same objection against this type of protective gear. Amish who choose to join fire companies know what they are getting into; also those who join are not the most conservative of all Amish either. What is odd in the local paper is that it sounds like Ovid is the only place that has Amish firemen, but they aren’t. There are other towns that have Amish firemen, in New York State, too. Yes the Amish wear standard issue uniforms just like any other fire person would wear. They wear the same jackets, and helmets that Englisher fire fighters wear, too. Also, the Amish go through the same training that the Englishers do. The only thing is they will not let a firefighter – Amish or Englisher – with a beard go into a burning building. It has something to do with the equipment might not cover their face as well as someone who does not have beard. Interesting to hear about other places in NY that have Amish participation Marilyn. Since there are a number of Lancaster-origin communities in the state I’m not surprised to hear that. But as Mark and Dorothy mention below it’s not only Lancaster-roots Amish who volunteer on fire departments. Thanks for letting us know. Shipshewana and Topeka Indiana also have Amish firefighters on their departments. They have auction fundraisers managed by the Amish community, although the auctions occur only once every 4 – 5 years. The Shipshewana auctions raise in excess of $150k per auction. Dorthy… do you mean the total amount made at the auction is $150K….and that the firemen get a cut of that? In order for the firement to get a full $150K all of the items would have to have been donated… and that’s a lot of donations. The last auction the net proceedo to the department were $187k. All items were donated. That was sure nice of everyone. Of course, they all benefit from it, but still. Thanks for the info Dorothy… would never have guessed that. It’s quite common here in Holmes County also. Interesting to hear about Amish fire company participation in Ohio and other states. I think most people associate it with the Lancaster community where I believe it is most prominent and has the deepest tradition; we also know of it there since the mud sales are pretty well-known. Interestingly, Amish in Lancaster also serve as EMTs on ambulance crews (this info is in the book The Amish p. 362). I’d guess you are aware of this as well Mark, I knew an Amishman in your community who did the same thing in Holmes County. Yes, I know of a few EMT’s who are Amish. You make a good point that Amish people involved in such volunteers positions are not from the lowest Amish. I’m not sure where the Dan Gmay stands on that, but I can’t think of any Dan Gmay people that I know are involved with fire departments or EMT in the sense they’d go out with the crews. Again, I might just be unaware of it, as there are not so many of them in our immediate neighborhood. I do know the Swartzentrubers etc. would definitely not. There was a tractor wreck near us on #39 Fri. evening and many of the responders were Amish. As we were watching this, a few travelers from out of state were also stuck there watching and they were surprised to see this. In the Army, and a couple of the other services they are not able to have beards or mustaches that go down too far because of the gas masks they may have to put on. You have to have a good seal for the mask for it to work properly. Now the Navy didn’t seem to have to follow this, but I would wonder that how those on board that would have to deal with any potential ship fire would handle it. I suppose they too had to keep clean shaven. I have asked at a couple of Amish communities I’ve visited in Iowa and Missouri about them taking part in the fire department. The only thing they do is support the firement in fund raisers… sometimes supplying the food for a pancake feed and or helping serve the food. I’m not sure if there is a restriction on them not to help, maybe just no one has asked them. First, firefighting isn’t everyone’s cup of tea. Service to the community/company in administrative positions, fundraising, or Fire Police (traffic control) are as important as riding the rigs. I would doubt that any Amish would wait for an invitation to join their local fire company. Rather, in typical Amish fashion, I believe that if they see the need they would step up to volunteer. One of the Lancaster fire companies has this wording in the “About” section of their Facebook page: “…One of the challenges of the Department is to have drivers on hand to drive the equipment. Since a large part of the community is run by the Amish, often times the first truck will leave the station with 5-6 men on board as asoon as the first driver arrives…”. What a timely topic during Fire Prevention month (and 143 years since the Great Chicago Fire). As for the Amish rolling out a hose so quickly, it just speaks of the teamwork that Amish are known for—the entire community pitching in when needed. 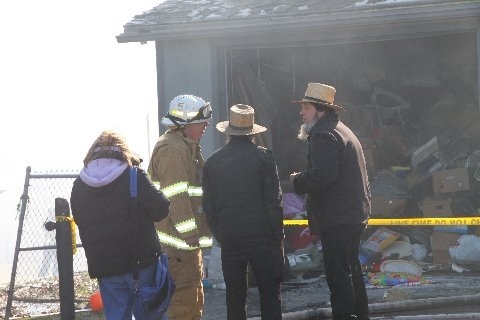 I’m happy so many Amish districts allow volunteers to help their local fire companies. It is a concern about drivers, however. Are there still any horse-driven fire companies? Across the street from where I grew up in Chicago was an old fire company that my Dad (he’d be 102 this year) remembered watching the firemen hitch up a team of horses to pull the “boiler”, or whatever it was called. I was always fascinated to think of how exciting that must have been to a kid! By the time I came around, it was used as a garage for a commercial laundry. The issue surrounds the firefighters’ use of self-contained breathing apparatuses (SCBAs). If designed for use under water, it is called SCUBA (self-contained underwater breathing apparatus). Just as NFPA requires that firefighters who wear air packs (SCBA)can not have facial hair (so as to make a good seal on the facepiece) the packs have, they also require the type of gear worn by firefighters. Total weight with A/P is about 70 pounds. As hard a workers as the amish are, it does not surprise me that they make excellent firefighters. The training aspect I find interesting. Here in NJ we require about 96 hours combine training (classroom and field training)for firefighter 1 in the first yesr to become a reqular firefighter. I would be curious to see their training requirements. To attend school here you have to be clean shaved.